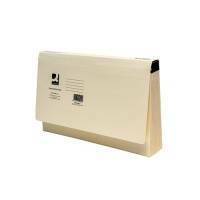 Fellowes Black Bankers Box Expanding Handifile 9351501 Pack of 1 "Bankers Box Handifile. 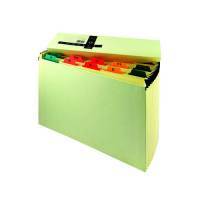 Expanding file with 21 sections, ideal for sorting and filing household or business paperwork. Fibreboard construction with plastic carrying handle and locking clasp. Supplied with pre-printed and plain index labels. Black." 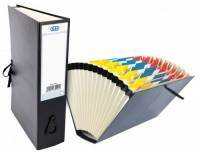 Elba Black Expanding Fan File 16 Pocket 100080766 Pack of 1 Elba 16-Pocket Expanding File. 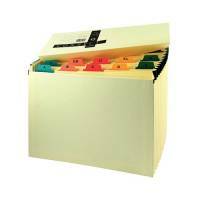 High quality A-Z 1-31 and Jan-Dec filing system. 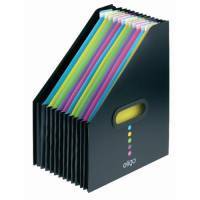 Features colour co-ordinated spine label laminated tabs cloth tie tapes reinforced side tapes rigid spine and sides. 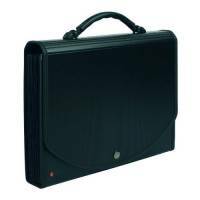 Suitable for documents up to Foolscap size. 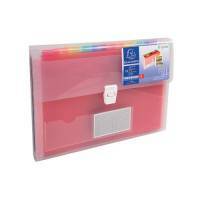 Europa Expanding File 13-Pocket 55298E Pack of 1 Europa Expanding File. A4 size has elasticized closure with 13 sections. Comes complete with coloured index labels and tabs. 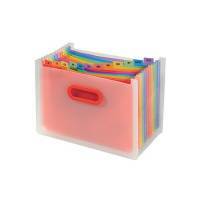 Perfect for filing documents and simple to retrieve with the divider tabs. Made from sturdy plastic material that lasts long. 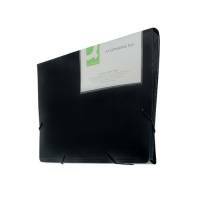 Exacompta Exactive Exafolio Conference Folder 6-Part Black 55834E Pack of 1 Exacompta Exafolio organiser. 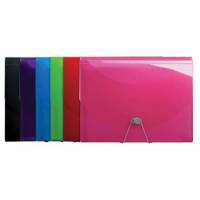 Portfolio with integral six compartment expanding file and A4 pad holder. Made from lightweight recycled polypropylene material. Features internal zipped pocket, pen holder and popper closure. Rapesco Blue Designer A4+ Expanding File 7-Part Polypropylene 0679 Pack of 1 "A4+ 7 Part Designer polypropylene Expanding File with 7 separate compartments, allowing you to organise your projects. 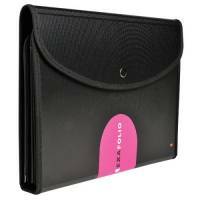 Features secure closure lock, index tabs, business card holder on the cover and pen holder cut-out under the curved flap." Rapesco Assorted A4+ Project File Assorted (Pack of 5) 0668 Pack of 1 Rapesco 5 part Project file. 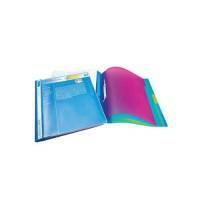 Durable A4+ file with 5 transparent coloured tabs for easy indexing. Each part has a non-tear plastic fastener for 2-hole punched papers. Front page visible through cover for presentation. Supplied with index sheet. Assorted. 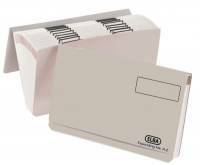 Q-Connect Expanding File 31 Pocket Numbered 1-31 KF04090 Pack of 1 Q-Connect 1-31 Expanding File. convenient organiser for all your personal and work documents. Manufactured from strong manilla with reinforced gussets and thirty-one filing pockets. Suitable for both A4 and Foolscap papers. Q-Connect Mylar A-Z 19-Pocket Expanding File KF04091 Pack of 1 "Q-Connect A-Z Expanding File. convenient organiser for all your personal and work documents. Manufactured from strong manilla with reinforced gussets, multi-coloured mylar tabs and nineteen filing pockets. Suitable for both A4 and Foolscap papers." 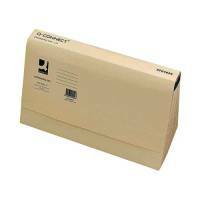 Q-Connect Expanding File 1-31 Mylar KF04092 Pack of 1 "Q-Connect 1-31 Expanding File. convenient organiser for all your personal and work documents. Manufactured from strong manilla with reinforced gussets and indexed A-Z, 1-31, Months and Quarters. Suitable for both A4 and Foolscap papers." Q-Connect Multi-Purpose 16 Pocket Expanding Wallet KF04093 Pack of 1 Q-Connect multi-purpose Expanding File. convenient organiser for all your personal and work documents. Manufactured from strong manilla with reinforced gussets and sixteen filing pockets. Suitable for both A4 and Foolscap papers. Colour - Green. Q-Connect Manilla Foolscap Expanding File A-Z KF22001 Pack of 1 Q-Connect A-Z Expanding File. convenient organiser for all your personal and work documents. Manufactured from strong manilla with reinforced gussets and nineteen filing pockets. Suitable for both A4 and Foolscap papers. Q-Connect 13-Pocket Black Expanding File Pack of 1 "Q-Connect Expanding Files. 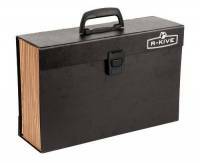 13-part expanding file manufactured from hard wearing polypropylene, features one pocket beneath the front flap to store a 3.5in diskette in each. Size: A4. Colour - Black." 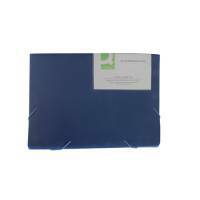 Q-Connect 13-Pocket Blue Expanding File Pack of 1 "Q-Connect Expanding Files. 13-part expanding file manufactured from hard wearing polypropylene, features one pocket beneath the front flap to store a 3.5in diskette in each. Size: A4. Colour - Blue." 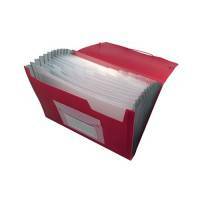 Q-Connect 13-Pocket Red Expanding File Pack of 1 "Q-Connect Expanding Files. 13-part expanding file manufactured from hard wearing polypropylene, features one pocket beneath the front flap to store a 3.5in diskette in each. Size: A4. Colour - Red." 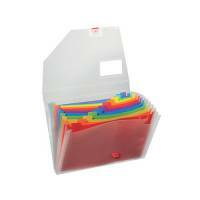 Snopake 6 Part Expanding Organiser A4 Clear 11893 Pack of 1 "Polypropylene 6 part expanding files are tough, durable and water resistant. Six compartments for filing complete with index tabs for presentation. Clear." 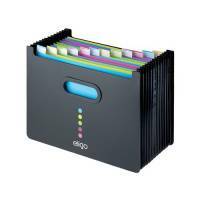 Snopake Eligo Desk Expander 13 Part Portrait Black 15171 Pack of 1 "Ideal for sorting and filing documents where storage is limited. 13 expanding sections. Made from smart, strong black polypropylene. Supplied with colour-coded insert tabs for indexing. Closed dimensions: W255 x D65 x H320mm. Portrait." Snopake Eligo Desk Expander 13 Part Landscape Black 15174 Pack of 1 "Ideal for sorting and filing documents where storage is limited. 13 expanding sections. Made from smart, strong black polypropylene. Supplied with colour-coded insert tabs for indexing. Closed dimensions: W320 x D65 x H255mm. Landscape."